Date Night continues our quest for good burgers in Atlanta. We are still searching for one that beats Holeman and Finch. Will we find one on today’s date? We are in the concrete demilitarized zone between Roswell and Alpharetta, also known as Mansell Road. There are shopping centers for as far as the eye can see. 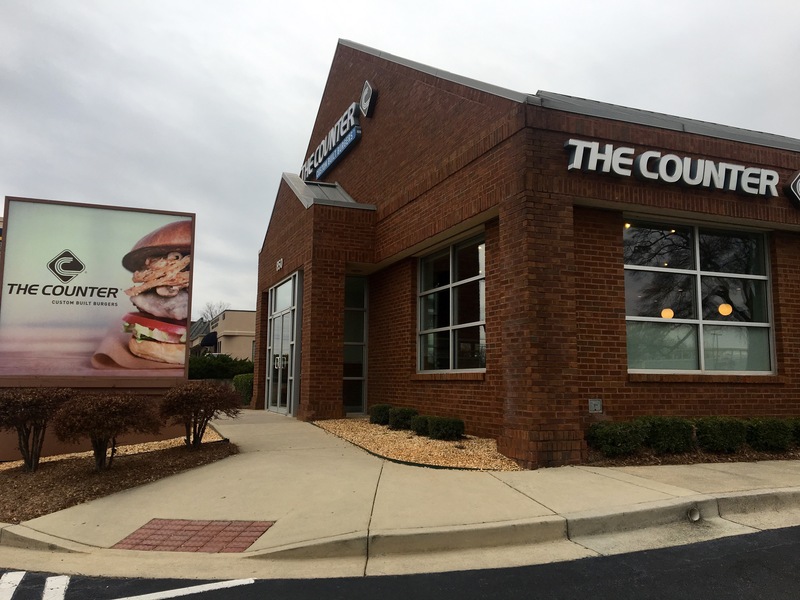 The Counter is a west-coast chain, but this is the only location in the ATL. We have eaten here a lot in the past, but not lately. There is a genuine counter at The Counter. Behind it, there are eight taps, which we are glad to report have local beer flowing through them. There’s no mass-produced swill here. It’s lunchtime, so there won’t be any beer pics today. We are joined by our pals Bev and Charlie, so you will see more food pics than normal on today’s date. We eat a late lunch, which is why everything is so empty. There is a main area and an outside area that must rock in warm weather. Garage doors go up when they can, which makes the patio very versatile. 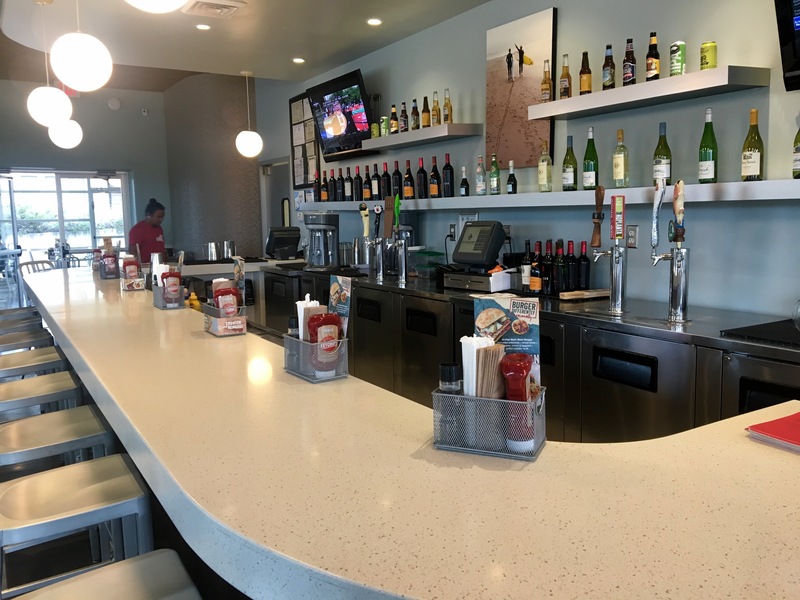 The beauty of The Counter is that you build your own burger. The possibilities are endless. 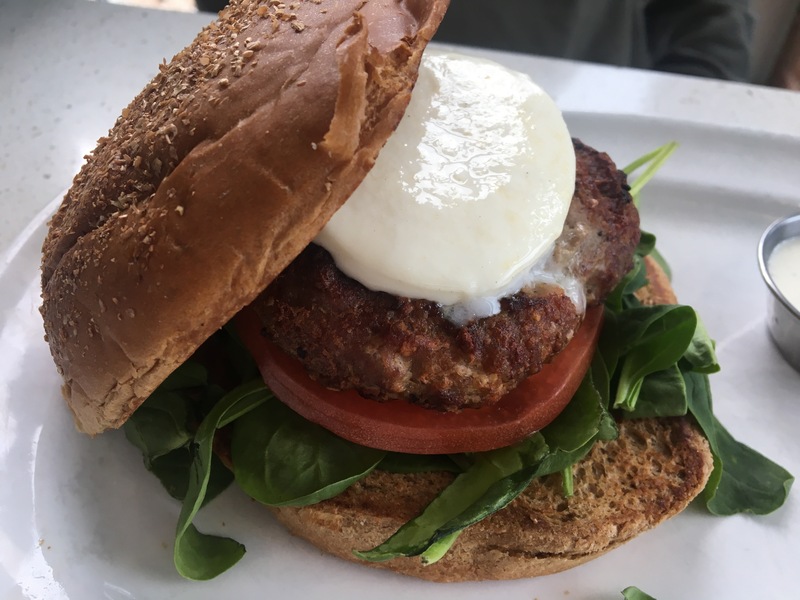 It’s a good, moist turkey burger cooked just the way I ordered it. 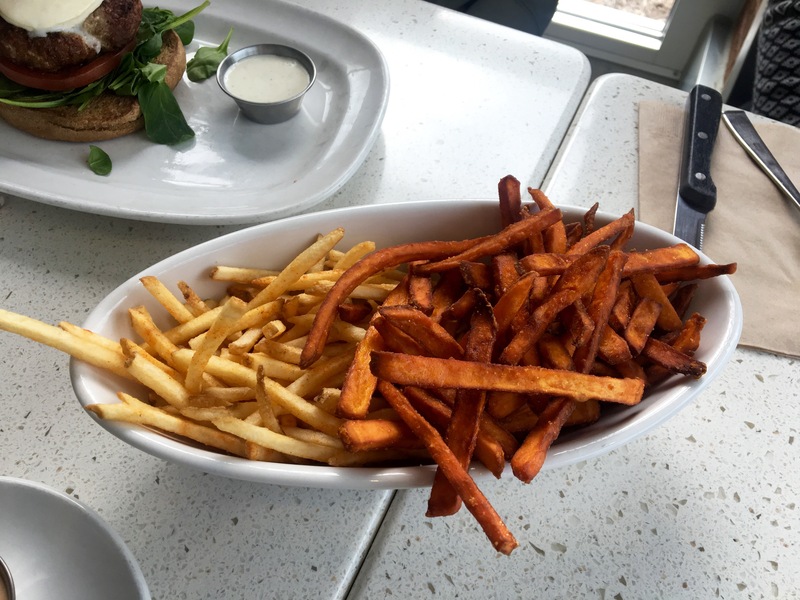 I thought the $3.25 up charge for the fries was a bit high and you can’t mix the fries with sweet potato fries unless you get them as a much more expensive appetizer. 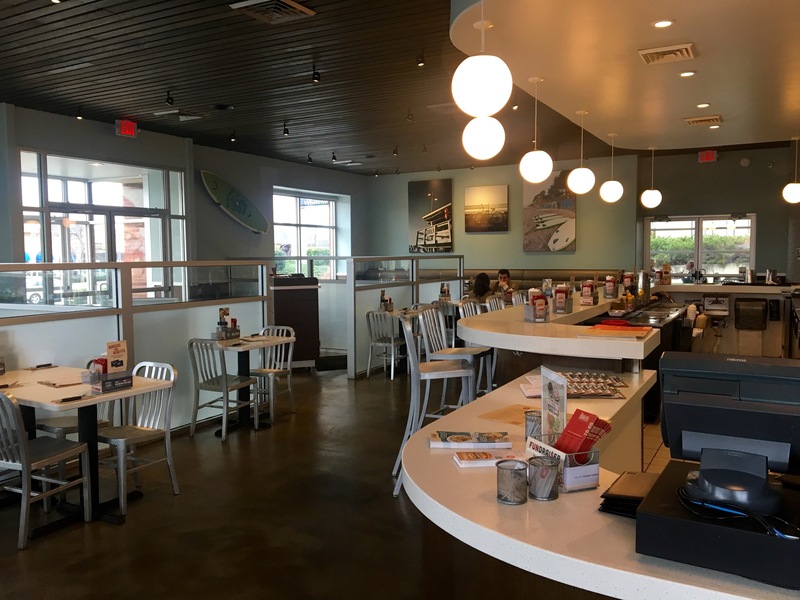 If you don’t want to make your own, there are twelve burgers on the menu that The Counter has come up with. They could probably “cute” up the names a bit as “The Counter Burger” and “Bacon BBQ” kind of scream for better monikers. 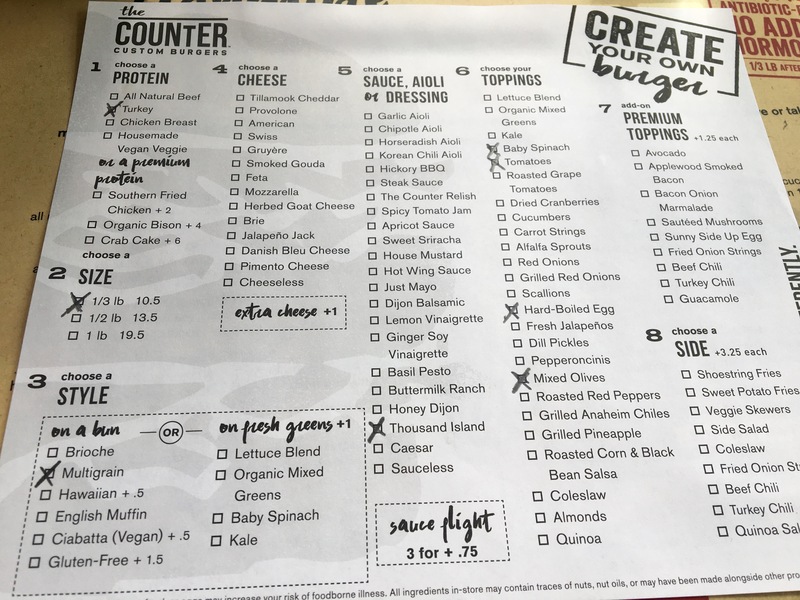 Another option is to make your burger a salad and build your own. 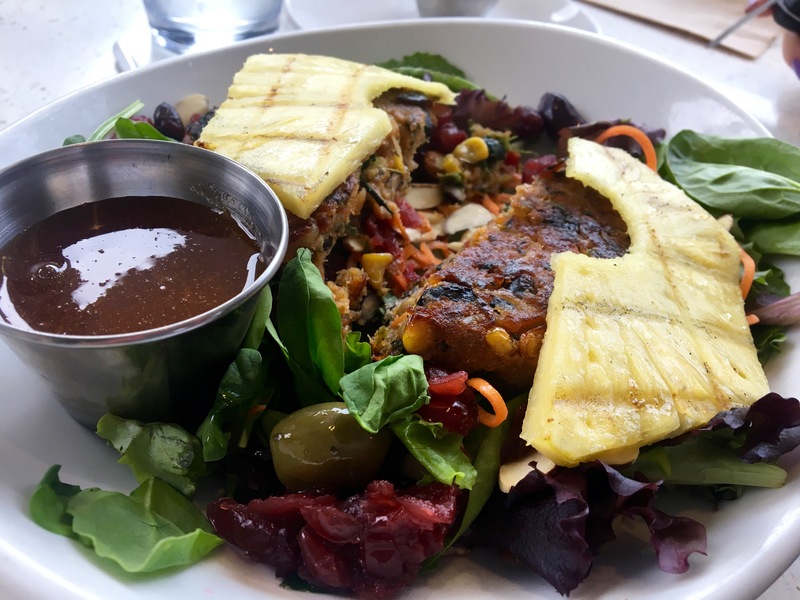 My healthy date gets a veggie burger patty with all sorts of salad fixings including grilled pineapple and a delicious olive medley. 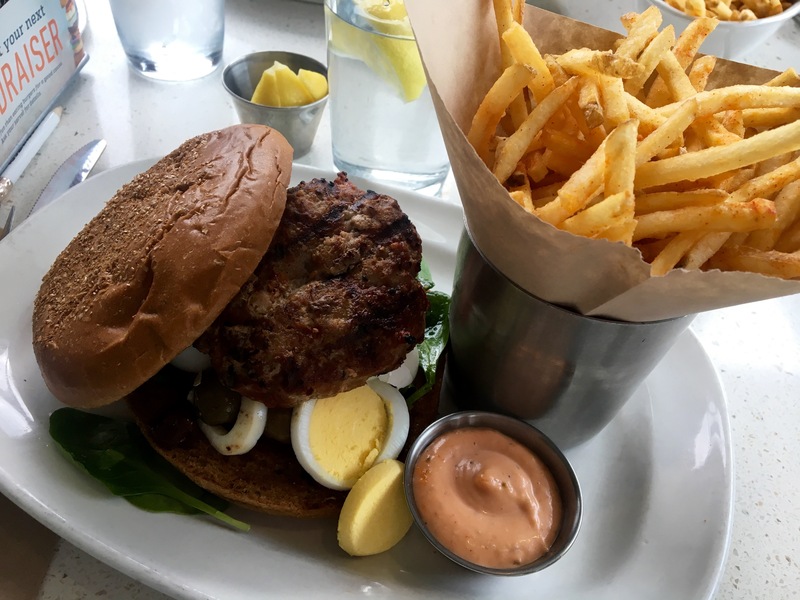 “This is the best veggie burger I have ever had,” she says as she takes another bite. Vegetarians, take note! Charlie builds a burger too. He gets a big dollop of mozzarella on top. Did I mention that I forgot to put cheese on my burger? Don’t want a burger? 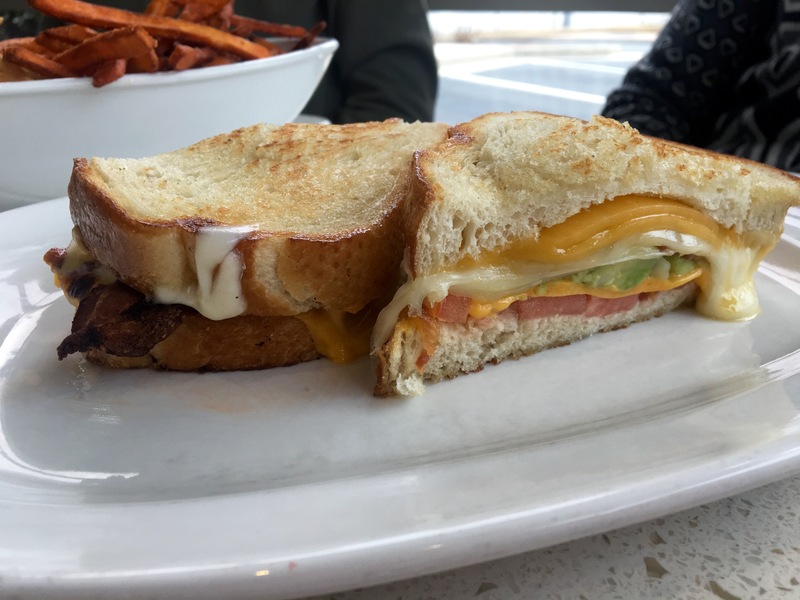 Try the grilled cheese trifecta. As the name suggests, there are three cheeses in there: Tillamook cheddar, provolone, and American. Bev really enjoys this sandwich, and it looks great. Is this a contender for the best burger in Atlanta? Not really. However, we really like the choices here. You can order your burger with your favorite things. On your next visit, you can order something completely different. Meat loverss and vegetarians will agree: this is definitely a menu that you won’t tire of. Have y’all tried Red Eyed Mule? 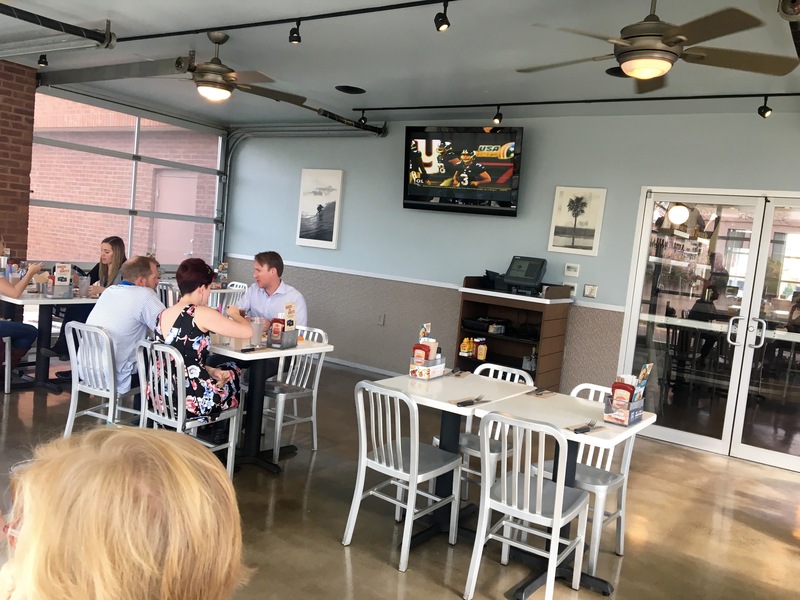 (I didn’t see it on your “past” reviews) I think the burgers there are outstanding and reasonable. Don’t know if they have veggie burgers – I always opt for the beef. Only open breakfast and lunch. http://www.theredeyedmule.com Not important but……the owner is a woman who is drop dead gorgeous and very friendly. Roger (along with 100’s of other men) will love this place.